Review: NPS® Vs Customer Satisfaction Vs Customer Effort Score? In the search for the perfect customer feedback metric there is an ongoing arms race. It started with the venerable Customer Satisfaction. Then came the Net Promoter®. More recently we have seen the Customer Effort Score, and another new word of mouth metric recently released. What about Net Emotional Value (NEV) or Net Value Score? Nobody wants to be seen dead in last year’s customer feedback metric (oh the embarrassment, I could just die) but with so much choice it naturally leads to the question: which customer feedback metric is the best? Why Do We Need a Metric in the First Place? Most of the time customer feedback is about understanding what you need to change to improve customer loyalty, and referral propensity. So you need an index, proxy or measure for the loyalty of each respondent. As you continue to improve your customer experience you need a measure against which you can compare yourself. How much better, or worse, are we than last quarter? You might also want to benchmark yourself against other companies. In statistical terms you also need a useful dependent variable that you can use to determine how each of your independent variables (service and product attributes to you and me) impacts on customer loyalty and how important is each one. At the moment there are really four common options, plus a couple of new players on the block, for the best customer feedback metric. Let’s look at each of them in turn. This is the maiden Aunt of Customer Feedback Metrics and it’s been around for many, many years and is simple to use. If you’ve seen it once you have seen it a million times. Kindly, familiar and always ready to fill its place in the survey question line up. How satisfied were you with your recent product? The key downside of Customer Satisfaction is its lack of predictive power. Generally satisfied customers don’t often behave much differently to generally dissatisfied customers. That begs the question; why ask if what you are getting is not useful? Basically it does not perform task 1. Proxy for Customer Loyalty very well. This was officially launched into the public realm in late 2003 in a Harvard Business Review. Not happy with the predictive power of Customer Satisfaction, Frederick Reichheld, Bain and Satmetrix tested a range of questions with the goal of identifying a question that would predict future actual future purchasing patterns. The result was Net Promoter Score. How likely would you be to recommend our company to a friend or colleague on a scale of 0 – Very Unlikely to 10 Very Likely. By subtracting the percentage of 0-6 scores from the percentage of 9 and 10 scores you arrive at the NPS. This was shown to be more highly correlated, more often, with future revenue growth. Download a more complete introduction to the Net Promoter methodology here. Once again this question was shown by the authors to be a good proxy for loyalty, potentially as good as NPS. 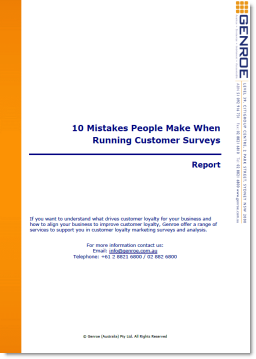 10% of Customer Satisfaction + 23.6% of would buy again for the first time + …. Implemented correctly these scores can be more accurate than any of the other scores. They do however require advanced statistical skills to implement and can be difficult for staff to understand and use. Almost every month a new question is launched: Net Emotional Value (NEV), Net Value Score, WoMI (Word of Mouth Index). Each of these vies to be an even better predictor of loyalty. Each of the developers is looking for a silver bullet in the science of finding the perfect customer feedback metric. I am not going to go into details for each of these flavour of the month metrics mostly because they change so frequently they tend to violate the “general acceptance” and “body of support material” tests. So which is the best metric? That really depends on what you are looking to achieve. Some people will suggest that you should use the score with the highest accuracy. That is not necessarily the case as there are many elements of the score that will influence how easy it is to succeed in implementation. When comparing the different options what attributes are important. From our experience the following attributes are the most important in a customer feedback metric. Predictive Power: is the score an effective predictor of customer loyalty? Ease of Understanding by All Staff: Can it be explained to and understood by all staff quickly and easily? Ease of Use: Can the score be used to drive change in the organisation? Ease of Calculation: Can the score be calculated quickly and easily? General Acceptance: Is the score generally well accepted in the business community? Body of Support Material: Is there a good body of material in the public domain on which organisations can build their implementation approaches? Ease of Loyalty Driver Analysis: How easy is it to perform loyalty driver analysis? Let’s score each of the metrics. Yes, this is a subjective rating but I’m happy to debate these scores with anyone. Leave a comment if you disagree with a rating here and I’m happy to discuss. NPS is not the most accurate predictor of customer loyalty but it is the overall most effective approach. Overall it is as easy to user as customer satisfaction while also being more accurate. Net Promoter Score is not perfect by any means. Some researchers argue that the “net” approach reduces the information in the score, others highlight that it is not as accurate a predictor as could be achieved, and still others say that it is not a good predictor of word of mouth promotion. On the other hand some others say the net value makes the score more predictive. All this may be true but the most import attribute of any customer feedback indicator is that it can be used by the business to improve and become more customer focused. NPS has proven that it can do this better than the alternatives. Do you disagree with any of my scores or selection criteria? Let me know in the comments below. A score for customer loyalty or satisfaction that is made up of more than one question does not have to use any statistics at all besides mean value. Let´s say you combine the questions on, satisfaction, willingness to recommend and willingness to stay as a customer. All you have to do is to take the mean value from each question and device by the number of questions. There is no need to make the formula any harder that it have to be. Reichheld agree (in one of his blog post) that a multi question score is more accurate than a KPI based on single questions. There are many research studies showing the predictive power of satisfaction is better than the predictive power for NPS. I don´t what to spend to much time on this, so just have a look at http://en.wikipedia.org/wiki/Net_Promoter. There you will find links to sources. This might also be worth a look: http://thefinancialbrand.com/50483/whats-the-better-metric-customer-satisfaction-or-net-promoter-score/. Wikipedia also points out even more flaws in the NPS. If you would like to proclaim that NPS is the winner over CSAT I suggest that you counter by showing a peer reviewed study supporting your claim about predictive power for customer loyalty. I don’t agree on the ability to simply add a range of different questions and then take the mean to arrive at a predictor of customer loyalty. There is no logic in taking that approach as you could well be combining questions that do not predict customer loyalty. It is true that Reichheld agrees (as do I) that a multi-score question can be more accurate but the effectiveness of a measure is not just about how accurate it is but how easy it is implement and drive change in an organisation. NPS is superior to a multi-factor score in this regard. I disagree (with research to prove it) that straight customer satisfaction is better than NPS. If you read the source paper cited in the Financial Brand post (http://papers.ssrn.com/sol3/Delivery.cfm/SSRN_ID2568613_code2362740.pdf?abstractid=2568613&mirid=1) you will see that it clearly shows both Customer Effort Score and mean customer satisfaction are poor predictors of customer loyalty but NPS and “top two box” customer satisfaction are much better predictors. Thank you for a quick come back. I appreciate you response. As I see it, combining the right questions in a multi item score for loyalty is not a real problem if you know what you are doing. The three questions I mentioned would be a good trio as they all relate to loyalty. It would be more risky to put all your eggs in one basket and just use one question. For example, a question on recommendations (and therefor NPS) are not applicable in many instances. A question on satisfaction on the other hand is always relevant. The study in the Financial Brand post shows that satisfaction (even if looking at top 2 boxes it is still satisfaction) is the better measurement over NPS when it comes to predicting retention/loyalty. You say that NPS is easier to implement that a multi-score and to drive change. If the multi-score is complex I agree that it might be. But a multi-score don´t have to be complex. The study shows even as a single question satisfaction is still better that NPS for predictive power. I really can´t see how a single question for LTR would be any easier to implement that a single question of satisfaction so CSAT and NPS are equally easy to implement. Do you have peer reviewed research proving that NPS is better that straight customer satisfaction? I have yet not seen any peer reviewed study supporting this so it would be of great interest to see this. What is the name of the study and who made it? Hardly any (if any) of the sources (may be the German, I don´t know) that you put forward as “for NPS” in the “for and against list” are peer reviewed source. The one from London School of Economics might be credible but the study don’t compare NPS to satisfaction so it don´t support that is better in any way. “Scoring Success” by David Whitlark and Gary Rhodes seems robust and it even gives NPS the advantage for predictive power, but that’s just one study that is pro NPS in that regard. However numeral peer reviewed scientific studies gives the win to satisfaction when it comes to predictive power. But predictive power is not al. David Whitlark and Gary Rhodes also points out many flaws with NPS (reliability for one) and in Wikipedia there is also a bunch, and there are still more than the ones mentioned there. Considering the small amount of evidence of advantage in predictive power for NPS combined with all the flaws and disadvantages with NPS in other areas of importance I can´t see any advantage of NPS compared to satisfaction. I´m not saying that NPS can´t work, but for me the disadvantages are just too many, so if using a single question KPI, satisfaction is still the better choice in my book. You are correct “not a real problem if you know what you are doing” – the problem is that many people do not have enough expertise or statistics background to made these distinctions. It may be fine for people like you and I that spend all of our time in this topic but not everyone has that depth of knowledge. I’d rather have a tool that works 90% for everyone than 100% for a few and 50% for the rest. “even if looking at top 2 boxes it is still satisfaction” — no unfortunately not. That study found the mean satisfaction has no predictive power. It is only the top 2 box version that takes in the extremes of customer views (just like NPS) that works. Please do provide links for peer reviewed papers on customer satisfaction and I’ll add them to the list. Peer reviewed data in this area is difficult to find, and I do not count Wikipedia as peer reviewed. You are free to use the tool that you find most applicable but for me the proven predictive power of NPS (we have internal results on this as well) along with the breadth of tools and processes to apply it make it an effective tool for many organisations. I responded to you article because you claim that NPS have better predictive power than a measure of satisfaction. Would you be so kind share the research you say you have in support of you claim that NPS have better predictive power for loyalty (let´s stick to peer reviewed research). The study “The Predictive Ability of Different Customer Feedback Metrics for Retention” from the Financial band post) does in fact show that mean satisfaction have predictive power. Page 23: ” We observe that customer satisfaction (mean value), as well as most of the other CFMs, have a positive and significant impact at both the customer and firm level. You ask me to “provide links for peer reviewed papers on customer satisfaction” as it is hard to find. One simply just have to have an interest to find it and then use google scholar, so it´s not that hard. I´ll ad some more peer reviewed articles to the ones already on Wikipedia so that you and everyone else can take part of them. You can then ad from there to your own list. The flaws with NPS noted in Wikipedia is already to some extent from peer reviewed research and the sources are noted as reference. Just a quick update on this topic. While this references “net promoters” it does not test NPS. The construction of the data they use is completely different to NPS and cannot be equated. Compare “How likely would you be to recommend us to a friend or colleague” to the definition from the paper, below. The problem is in the term prediction. I predict from movements in a downstream metric that you will get more spend. The downstream metric is dependent on what you do and how you do it. It is inherently correlative not causative. So there is no winner except for the real metric ‘use’: I use you more which predicts I use you more. I don’t think I agree wholeheartedly with what you suggest here. “Correlation is not necessarily causation” aside, the downstream metric you use should link to a business outcome you are trying to achieve. Otherwise the point is lost. On the other hand usage is important: you need to use the metric for it to useful. So much ego in the discussion and sarcasm. Haha.. You both should do a NPS and CSAT survey on each other and closed loop call to get along. I’m sure you’re a whole lot better at that with your customers in reaching an agreement than with each other. Thanks for dropping by. It’s true, the NPS Vs CSAT discussion can generate a lot of strong feelings.